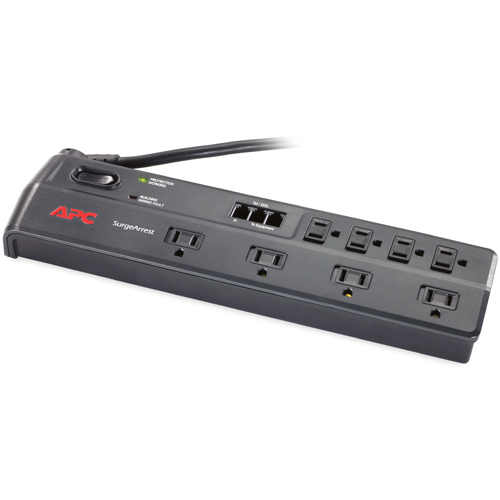 The APC Home/Office SurgeArrest provides guaranteed protection from damaging power surges and spikes. The SurgeArrest Home/Office family offers a premium level of protection, safety, convenience and reliability. Phone Line Splitter - Allows use of two pieces of equipment at once, such as a modem and phone. Receptacle Shock Safety Shutters - Shutters protect users from accidental contact with unused outlets. Fail Safe Mode - Most other surge suppressors continue to let power through even after their circuits have been damaged, leaving your equipment exposed to future surges. APC’s SurgeArrest fail safe, which means that once the circuit of an APC SurgeArrest has been compromised the unit disconnects equipment from the power supply ensuring that no damaging surges reach your equipment. Data-line Protection - Protection of data lines (Ethernet, Coaxial and Phone lines) ensures complete protection of your equipment from surges. It is very important to protect your equipment from “back door” surges traveling through data lines, as they can be as damaging to your equipment as surges traveling over power lines. Transformer Block Spacing - Connect bulky transformer block plugs without covering up other outlets. Right Angle Plug - Plug angle allows for equipment and furniture to be placed closer to the wall than with a standard power cord. Reduces cord stress too. 180 degree Rotating Cord Retainer - A 180-degree rotating cord with strain relief offers flexibility in positioning the SurgeArrest, and in routing the power cord. Lightning and Surge Protection - To prevent damage to your equipment from power surges and spikes. IEEE let-through ratings and regulatory agency compliance - Stringent third-party testing gives you confidence that APC's surge protectors will safeguard your equipment and data from potentially damaging surges and spikes.